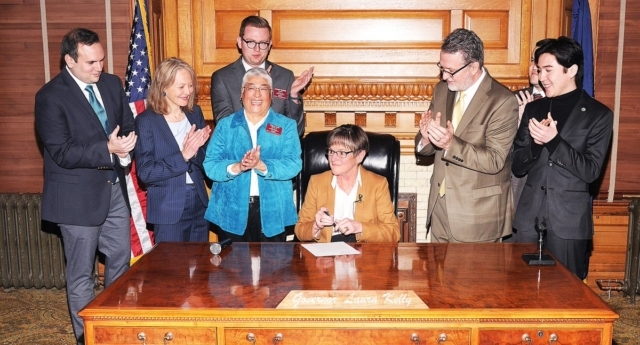 The new Democratic Governor of Kansas, Laura Kelly, has used her first official act to put LGBT+ discrimination protections back in place. Laura Kelly was sworn in as governor on Monday (January 14) after flipping the Republican-held position in November’s midterm elections, defeating Republican candidate Kris Kobach. The newly-elected official wasted no time at all in putting equal rights at the heart of her agenda, issuing her first executive order to reinstate laws preventing discrimination against state employees based on sexual orientation and gender identity. The executive order restores rules that were controversially abolished by her Republican predecessor Sam Brownback in 2015. Governor Kelly announced the action in her inaugural address, saying: “As I have said numerous times before, discrimination of any kind has no place in Kansas and it will not be tolerated in this administration. Official portrait of Kansas Governor Laura Kelly. The order, formally issued on January 15, says: “State employees are a vital part of creating and fostering efficient business practices and ensuring that all Kansans receive the support, services, and respectful treatment to which they are entitled. “The State of Kansas is committed to employment practices that prevent discrimination and harassment on account of race, color, gender, sexual orientation, gender identity or expression, religion, national origin, ancestry, age, military or veteran status, disability status, marital or family status, genetic information, or political affiliation that is unrelated to the person’s ability to reasonably perform the duties of a particular job or position. Sarah Kate Ellis of GLAAD said: “[This] shows all of us once again that elections matter. Democratic National Committee LGBTQ media director Lucas Acosta said: “Laura Kelly has reaffirmed that discrimination has no place in Kansas. Kelly has also declared her support for a wider LGBT+ anti-discrimination law in the state that extends to all businesses, though legislation on the issue is unlikely to pass through the Republican-dominated state legislature.